This carving is a classic demonstration of medieval Christian symbolism. 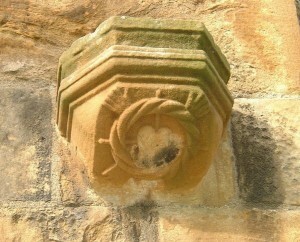 It shows, in the centre, a heart surrounded by a crown of thorns. Three nails, left, right and top, pass through the crown of thorns to pierce the heart. At the top right and left can be seen two hands. At the bottom left one can see a foot. The foot at the corresponding right hand side cannot be seen in this image. With the hands and feet this symbol denotes the Crucified Christ – the heart is Christ. The three nails piecing the heart (that is, him) are the three nails used in his crucifixion (one in each hand and one through both ankles) and the Crown of Thorns that which was placed on his head by the Roman soldiers in mockery of his claim to be King of the Jews. The thorns also represent the sins of the world which he redeemed through his death and resurrection. Seton Collegiate Church, in common with most other collegiate churches, has Christian symbols as a form of ‘shorthand’ by which the laity focus on the story behind the symbol. In pre-Reformation times virtually everyone would recognised this symbol to refer to the crucifixion of Christ. By using Christian symbols the church authorities hoped to educate and remind everyone of the principles of Christian thought. In this instance someone approaching the church would see this Christian symbol and it would ‘speak’ to them on several levels. One would be immediately reminded of the crucifixion, then that Christ had died for him or her and that one was about to enter a place where thanks and praise should be offered for his sacrifice in redeeming our sins. The strategic placement of this bracket (a platform on which a originally a statue would have stood) with its Christian symbol, on the buttress at the left hand entrance to the choir, was intended to reinforce the the meaning of the symbol described previously. Arguably, Seton Collegiate Church, because of the minimal use of symbolism, conveys the message of each symbol in a cleaner manner than at Rosslyn Chapel where the plethora of Christian symbols causes the individual meanings to be obscured – one cannot see the wood for the trees as it were.